Reduced the amount of hours you work each week? Were able to enjoy life's more meaningful things? Maximized your overall daily efficiency? 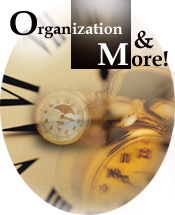 Let Organization & More organize your life with our personal and professional productivity organizers. With a productivity coach from our staff you will gain skills that allow you to improve your daily workflow as well as have better time and paper management. "The benefits of organizing last a lifetime!"